Although you want the programs you constantly use on the Quick Launch toolbar, you don’t want to put too many icons there. Other programs that you use frequently or regularly can be pinned to the Start Menu. Pinning frequently used programs, files, and folders to the Start menu can improve your efficiency by avoiding the need to work through layers of menus or folders. Fortunately, you can pin just about anything to the upper-left corner of the Start menu quickly and easily. Locate the item that you want to pin to the Start menu. You can put programs, folders, documents, or shortcuts on the Start menu. 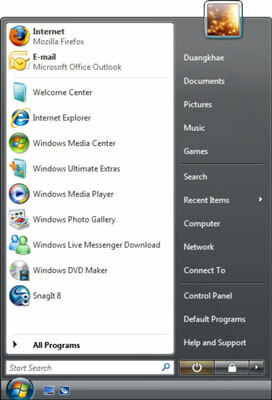 Vista system options, such as the icons in the control panel. A shortcut to a Web site; just click and drag the little icon to the left of the Web page’s address from a Web browser’s address bar to the desktop to create the shortcut and then pin that shortcut to the Start menu. Right-click the item. If you see an entry that says Pin to Start Menu, select it. An average Vista Start menu. The “pinning” area is the upper left corner. The item gets added to the upper-left corner of the Start menu, at the bottom of the list — which is to say, the new item goes immediately above the faint line dividing the upper and lower parts of the left side of the Start menu. If you didn’t see a Pin to Start Menu entry in the shortcut menu, left-click the item and drag it over the Start button. Hover there, and when the Start menu opens, drop the item where you want it in the pinning area on the Start menu. 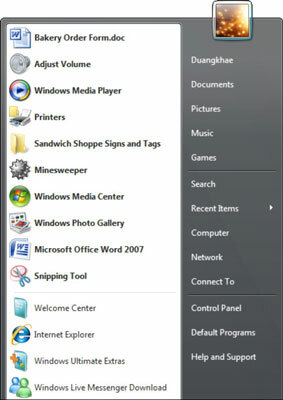 A customized Start menu; notice the new items in the “pinning” area. You should see your new shortcuts in the Start menu. Don’t like the text you see on an item pinned to the Start menu? No problem. Right-click any item, choose Rename, and type the name you want to see. Want to put the Vista sound volume control on your Start menu? It’s easy if you know the trick. Make sure Windows Explorer is set up to show you hidden files and folders. Navigate to c:WindowsSystem32, right-click the file, and choose Pin to Start Menu.